Police are investigating the circumstances surrounding the deaths of three sisters and another relative who were found inside a submerged car in locks northeast of Kingston. 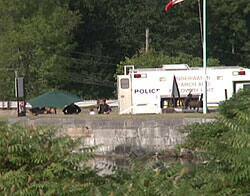 Ontario Provincial Police divers removed the bodies of three teens, aged 13, 17 and 19, and a 50-year-old woman described as a relative, from a vehicle found in the Kingston Mills locks around 4 p.m. Tuesday. The identities of the victims, who were all from Quebec, have not yet been released. They had been on vacation in southern Ontario and were on their way back to Quebec, police said Wednesday. They were reported missing by relatives. "It breaks my heart just saying it," Const. Michael Menor, spokesman for Kingston Police, said in an interview with The Canadian Press. "You have a family, they've all drowned. It's just horrifyingly tragic." Menor said investigators do not know what the car was doing in the area. "It's very very peculiar. There's no rhyme or reason," Menor said. "It's just not an area that anyone would drive their car out to." Parks Canada employees first noticed the 2004 Nissan Sentra submerged in about five metres of water around 10:30 a.m. and called police. It took divers more than two hours to get the bodies out. As part of the probe, police have seized the car and turned it over to mechanics for an inspection to see whether there was a mechanical breakdown or other forensic evidence that might help investigators. Police were to release details Thursday at 2 p.m. ET of arrests in the mysterious deaths of three Montreal sisters and their female relative, whose car was found submerged in water near a Rideau Canal lock near Kingston, Ont., last month. Zainab Shafia, 19, Sahar Shafia, 17, and Geeti Shafia, 13, were found in the car with their female relative Rona Amir Mohammed, 50, when the vehicle was discovered under water around 4 p.m. on June 30. Two men and a woman have been arrested in the case, though police did not immediately release their names or the charges against them. A press conference was scheduled to take place at Kingston police headquarters. On Wednesday, Kingston police said there was a "change in the status" of the investigation based on "what's happened in the last 24 hours." "It was a suspicious death and that has been changed," said Kingston police spokesman Const. Mike Menor. "We're not saying what that is." All four victims were from St-Léonard, Que., and had been reported missing by relatives. In an interview in their Montreal home after the deaths, the dead sisters' mother, Tooba Mohammad Yehya, said they were among seven siblings in the family. The girls are survived by two sisters and two brothers. Yehya said the family stopped in Kingston on the way back from a trip to Niagara Falls, driving in two separate cars. She said Zainab got the keys to one of the cars, saying she wanted to get some clothes from the vehicle. Yehya said her daughter was not an experienced driver, having driven only on a few occasions. After Zainab took the keys, Yehya said she doesn't know what happened. Sometime during their overnight stay, she said one of the family's two cars disappeared. The girls’ father, Mohammad Shafi, said the four women who died were all staying in the same hotel room. Shafi said Rona Amir Mohammed was a cousin. Five other family members, including Shafi and his wife, were staying in a separate room. The case had left police puzzled as to how the car left the road, travelled down a patch of grass " either over a concrete barrier or through a gate " and through two of the poles on the dock. The lockmaster at the Rideau Canal told investigators the locks were closed for the night and secured. CTV Montreal is reporting that the girls' mother Tooba Yahya, father Mohammed Shafi and brother have been arrested. They appeared in court in Kingston on Thursday morning. I've talked to Set about this a couple of times since it was first reported as an accident. We've gone to the locks there a number of times. I used to go there a lot as a kid. Used to ride my bike out there. I've posted quite a few photos from the locks when the autumn leaves were in full colour. One of my favourite maples is there. There was really no way for a car to accidentally end up in that particular spot. Weird and interesting, and still tragic. A father, mother and son have been charged with first-degree murder in the deaths of three Montreal sisters and their caregiver who were found dead in a car submerged in a canal in Kingston, Ont. The bodies of the three teenaged sisters and a 50-year-old woman were found in the car in the Rideau Canal on June 30. Kingston police Chief Stephen Tanner told a news conference this afternoon he was saddened at the "needless and senseless loss of innocent human lives." The girls' father, Mohammad Shafi, previously said the deaths occurred as the family was headed home after vacationing in Niagara Falls and had stopped for the night at a Kingston hotel. Shafi said he awoke in the morning to discover that one of the family's cars was missing from the hotel parking lot. Dj, is this the parents killing their own kids? I'm a little confused here. We've had a lot of weird stuff happening out in my neck of the woods. Honour killing, could be. Husband killing wife, etc. A photo sent to Kingston Police by Diba Masoomi, of France, claims the photo shows Mohammed Shafi marrying Rona Amir Mohammed 30 years ago in Kabul Afghanistan. Kingston Police have arrested at least three people in connection with the mysterious deaths of four Montreal women found in a submerged car in Kingston Mills on June 30. Police sources confirmed the dramatic development in the case yesterday, 22 days after a black Nissan Sentra was found in roughly three metres of water near one of the four locks. Three teenage sisters were found dead in the car, Zainab Shafi, 19, Sahar, 17, and Geeti, 13, along with a 50-year-old woman, Rona Amir Mohammed. La Presse newspaper in Montreal said three people who were heading to Pierre Elliott Trudeau International Airport were arrested yesterday morning. Initially, police said the case was suspicious but that they had not found evidence of foul play. It's not clear what charges are being laid, but the Whig-Standard learned that Kingston Police have been investigating, for at least two weeks, the allegation that the deaths were an honour killing. "We are convinced that this is a crime of honour," Diba Masoomi told Kingston Police, in an e-mail sent to the police chief's office roughly two weeks ago. The newspaper obtained a copy of the e-mail from Masoomi, who lives in Niort, France. She claims she is the sister of Rona Amir Mohammed and she also offered the stunning allegation that the dead woman was the first wife of Mohammed Shafi, the father of the three dead girls. She provided photos that she claims show Shafi and Mohammed at their wedding in Afghanistan 30 years ago. The couple never divorced. 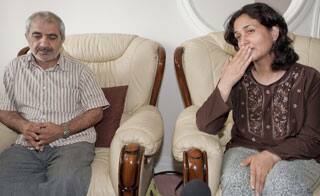 Masoomi said the marriage has been hidden since the family moved to Canada two years ago. In interviews after the deaths, Shafi and the woman he presented as his only wife, Tooba Mohammed Yhaya, said Rona Mohammed was a cousin. Ali Shafi, a 15-year-old brother of the dead girls, told the Whig-Standard in an interview July 8 that Rona Mohammed was his aunt. "For some time, my sister, as well as the Shaficouple's oldest daughter, Zainab, had been receiving death threats for social, cultural and family reasons," Masoomi's e-mail to Kingston Police states. In an interview through translation, Masoomi, who does not speak English or French, explained that Rona Mohammed has stayed in regular contact with relatives in Europe, and has told them she feared for her life. "She was really afraid," Masoomi told the Whig-Standard, through her daughter, Elaha Masoomi. "There were death threats." Diba Masoomi said that Rona Mohammed married Shafiin Kabul, Afghanistan. When she could not have children, he took a second wife, a practice that is not uncommon in Afghani culture. Shafi and his second wife had seven children. Masoomi said her sister remained with the family and raised the children, even when they moved to Dubai, in the United Arab Emirates, 17 years ago. TheWhig-Standard reached another relative of Rona Mohammed, sister Homa Kahoush, who lives in Sweden. She also does not speak English or French. In an interview translated by her son, Naveed Mohammed, she also said that Rona Mohammed was Shafi's first wife, a fact that was hidden by the family in Canada. Kingston Police have refused to comment on any of the information. "Nothing will be released until tomorrow," Const. Mike Menor said late last night. Police have scheduled a news conference for 2 p.m. today. "Police investigators are announcing a change in the status of this ongoing investigation," police said in a release yesterday. In interviews four days after the car was found underwater at Kingston Mills, Mohammed Shafiand Tooba Mohammed Yhaya surmised that the car ended up in the water as the result of a joyride. They said their eldest daughter, Zainab, had taken the car without permission in the past, even though she did not have a licence. She was trying to learn to drive. "My big daughter, she sometimes wants to try" to drive, Yhaya told theToronto Star. The family said they were returning to Montreal from a family trip to Niagara Falls on June 29 when they decided to stop in Kingston because they were fatigued. They had driven in two cars, a Lexus SUV and the Nissan. They stopped at a motel for the night at about 1 a. m., they said. The four women who were later found dead slept together in one of two motel rooms the family rented. Yhaya said some time later, Zainab came to her room and asked for the keys to the family's Nissan so she could get some clothes from the car. The next morning, when she awoke, the mother said the Nissan was missing along with her three daughters and Rona Mohammed. The family could not reach anyone by cellphone. They filed a missing-persons report with police and drove on to Montreal, believing the other group had left without them. Ali Shafi, who was on the trip to Niagara Falls, told the newspaper he could not remember at which motel the family stayed. A longtime tenant at the Lord Nelson Motel on Hwy. 15, Bob Asselstine, told theWhig-Standard that he recalled seeing a large family, driving in two cars, silver and black, who arrived at the motel one evening a day or two before Canada Day. He said he believed they arrived around 9 or 9:30 p.m. The motel's guest receipts for that night did not show that anyone by the name Shafi stayed at the motel, which is roughly two kilometres from Kingston Mills. It is the first motel visible to a traveller on Hwy. 401 who turns south onto Hwy. 15. In the past weeks, Kingston Police have been collecting video surveillance footage from gas bars and other retail operations along the highway. A Kingston woman, Shirley Gibson-Langille, told the newspaper that she's certain she saw the four women who were later found in the car at Kingston Mills in the early evening of June 29, walking around the property. Kingston Police said previously that information was incorrect. Police were at the Shafi family home in Montreal on Tuesday evening for roughly three hours, according to a neighbour. Mario Carpanzano has been a neighbour since the Shafis moved into the multiplex directly across from his home on Rue Bonnivet. On Tuesday night, Montreal police officers parked in front of his house at about 6 p. m., accompanied by an unmarked car, he said. "The police car came and parked in front of my gate. Then another car from Kingston arrived. It was people dressed in suits," Carpanzano, 65, told the Whig-Standard yesterday. "It had an Ontario licence plate," he said when asked how he knew it was Kingston Police. All of the officers went into the Shafi home. He saw camera flashes through the windows. Three hours later, at about 9 or 9:30 p.m., the officers left. Carpanzano said the family remained at the house, including the father, mother and brother. "I was on my neighbour's balcony talking," he said. "They waved at us and we waved back." Later, he noticed members of the Shafifamily leave in a van. He went to bed, so he didn't know if or when they returned that evening. When he left his house at 5 a. m. Wednesday, he didn't notice anything suspicious. Rue Bonnivet is a tree-lined street in the middle of a predominantly Italian neighbourhood in the east-end Montreal suburb of St. Leonard. All of the houses in the district are four-plexes. The Shafifamily rented the middle and lower floors at 8644 Bonnivet. The homes all have balconies where residents closely watch their neighbours' comings and goings. Carpanzano said that over the past two years, many Moroccan and Algerian families and people of middle eastern origins have been moving into the area. Since the deaths, Carpanzano said, the father, Mohammed Shafi, "always had his eyes red like a person who was crying." He said Rona Amir Mohammed "was presented to us as a cousin of the man." Carpanzano said the family members seemed to be close, but he did notice that Rona "was very often alone" when she went for walks. "They were very private people. It seemed they didn't have a lot of friends or relatives in Canada or Montreal. They were so close to each other in the family," he said. "We didn't notice anything different. The kids, they used to play with her." The only turmoil the family displayed, according to Carpanzano, occurred about a month before the deaths at Kingston Mills when the oldest brother told him that his sister, 19-year-old Zainab, had left home suddenly. "The older brother said, 'We called the police because my sister, she ran away,' " recounted Carpanzano. "From what we heard, it seemed she was going out with somebody the parents didn't want and she ran away, defying her parents' authority." He said the brother didn't mention anything about her possibly having married. "The only thing I know is he said she was seeing a guy, but the family did not agree with that. The family didn't say why," said Carpanzano. Kingston Police have described the incident as perplexing from the start, noting that a car would have had to negotiate many obstacles to make it into the water at that spot in Kingston Mills. There was no damage to any of the lock equipment, tables or other objects around the edge where the car is presumed to have plunged into the water. The submerged car was first spotted by a lock worker who was preparing to move the first boats through the canal that day just after 8:30 a.m. The car was resting on its wheels, its front end up against the lock wall, as if the vehicle plunged in backwards. Police have never released any information about what was learned when autopsies were done on the victims. What allegedly happened, according to statements from family and police. * 1 a. m.: Shafifamily arrives at east-end motel driving a black 2004 Nissan Sentra and a silver Lexus SUV, they say. * 1:30 a. m. or later: Zainab Shafi, 19, enters her parents' room and asks for keys to Nissan to get clothes out of car. 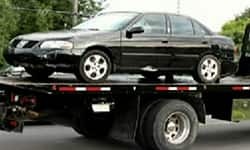 * 7:30 a. m.: Tooba Mohammed Yhaya and her husband, Mohammed Shafi, awake to find Nissan missing. They go into police headquarters that morning to file a missing person's report before heading back to Montreal. * 8:30 a. m.: First boats head into locks at Kingston Mills. Parks Canada workers notice oil plume on water and then see a submerged car at the northeast corner of the upper lock gates. A police dive team is called in and the car and bodies are removed in the afternoon. * Autopsies performed on the four women found in the car - Zainab, her sisters Sahar, 17, and Geeti, 13 and their relative Rona Amir Mohammed, 50, described by family as their aunt. * Police send two-man survey crew to plot the terrain around the lock station. There are very few hints of a car coming through the area and tire tracks don't appear to be conclusive. * Shafifamily buries the four dead women at an Islamic cemetery in Laval, Que. Further services are held in the coming days. * Kingston Police visit area businesses along Hwy. 15 to check security video and hotel logs. * Police arrest three people but remain mum about further details. An afternoon news release announces a 2 p. m. news conference today to announce "a change in the status of this ongoing investigation." That's pretty bloody sad. Lots of families have problems, but to kill? I KNEW IT WAS AN HONOR KILLING!!! Those stupid people (that murderous family) think Canadian police will buy their S*** about what may have happened. They may get away with that where they came from but here we actually INVESTIGATE and CHARGE people for committing murder. When will they learn that when they come to this country they should realize that we fight hard for women's rights? As for the relatives who also give 'ridiculous' stories about the dead older daughter who took the car without her parents permission, I hope the general public will ask them wherever they go, "How did you ever come up with these ideas? Do you think we actually believe them?" I hope those three will rot in prison for the next 25 years. Just because the son was 'only 18' at the time of the murders doesn't mean he should get off easy. After all, who would want HIM to raise his younger surviving siblings while his parents are in prison? JUSTICE!! !